This is another week of exploring the bowels of my photo library looking for inspiration. I found photos of this interesting old building that I stumbled across 2 years ago and yet I couldn’t find any record of having written about it before now. A little off topic, but the fire hydrant wearing a dunce hat appealed to my sense of humour. The broken lettering over the doorway suggests it was once a police station, but I couldn’t find any information on this little castle wannabe. At the time I took the photo, it was serving as a day care centre. 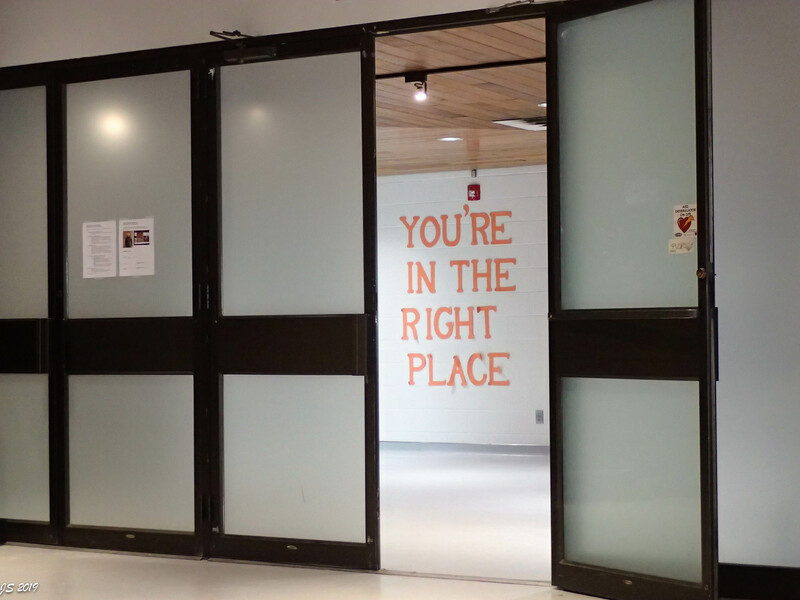 I found photos that I took only because the message accompanying the door made me smile. This sign would be a lot funnier if it was on a door leading into a maternity ward! Then there were the reminders that sometimes things just go wrong. 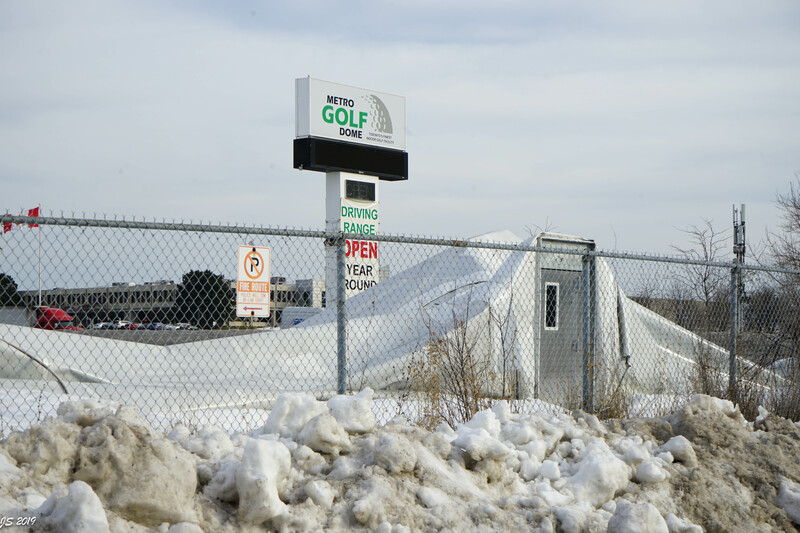 Last week after we were dumped with 30 cm (12 in) of snow over a 15 hour period – followed by howling winds – this golf dome suffered a fatal blow and came crashing down. 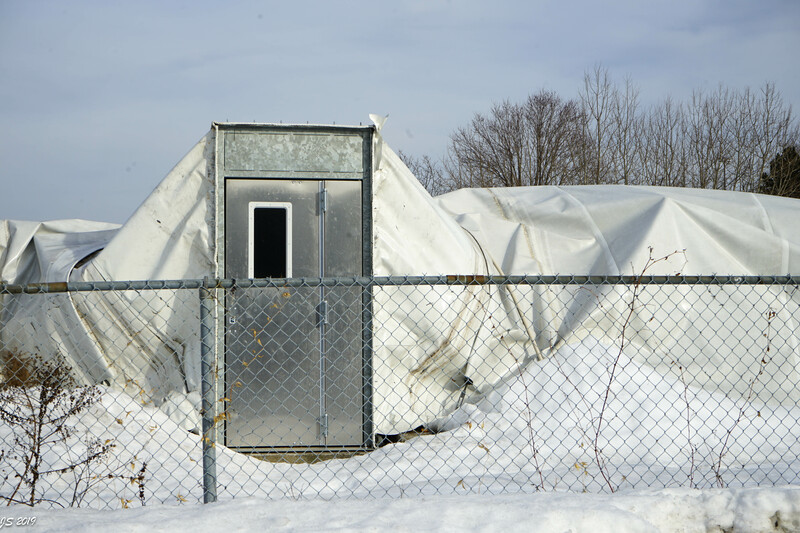 Now the emergency exit doors are all that remains standing of the giant bubble. I had planned to get a winter membership this year to try and improve my golf swing, but I never got around to it. …. sometimes procrastination pays off. This post is part of the weekly photo feature Thursday Doors hosted by Norm Frampton from Norm 2.0. It’s fun to go back and wander through the photo archives, isn’t it!? Yikes to the poor golf dome! Not only good you didn’t get a membership financially but practicing a swing at the time would have been disastrous! 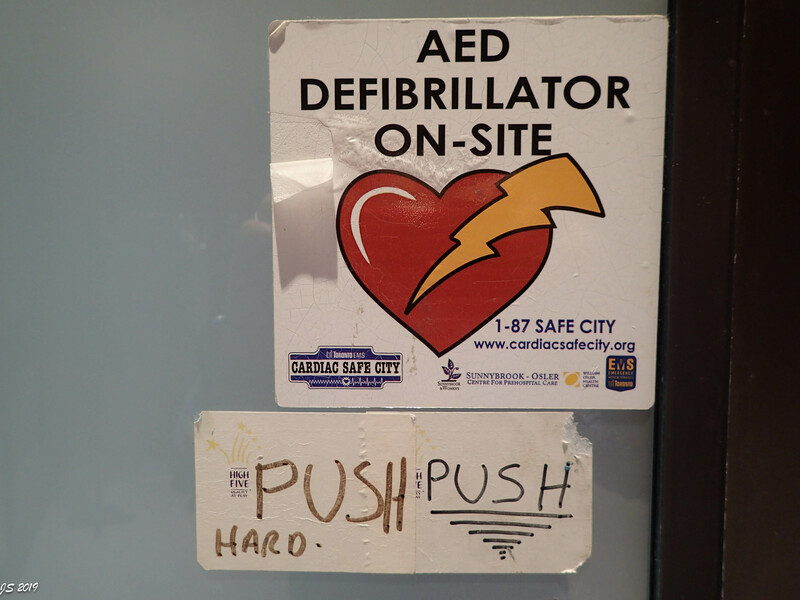 As to the door with the AED sign the old nurse in me immediately thought of CPR and pushing hard on the chest. Hope the snow has let up and your winter is becoming tamer. OMG – you had me roaring with the benefits of procrastination. From here on, I will have that image in my mind when I circuitously make my way to an end goal (I have long since said that procrastination is not a bad thing, its part of my process :-). The first building (again making me laugh with the fire hydrant who looks like he’s donning a lampshade after a bit too much to drink) is charming but somehow, it doesn’t feel ‘cozy enough to be a daycare center…perhaps removing the remanents of the Police Station lettering would do the trick ;-). I enjoy catching up on reading blogs when I have access to wifi right now. It’s funny how it’s the little things that make us smile, Joanne. The dunce cap and the push hard. I get it. The deflated bubble clearly depicts some of the significant weather patterns this year on Planet Earth. Ouch – I think I’d go a little squirrelly if I didn’t have access to wifi! I agree – I’m sure that old building has seen a few different lives. I’m just glad to see these wonderful old places are preserved and used! Interesting. Now I’m going to be intrigued by what follows next. Push, push hard 😊 that made me giggle! I got a bit lost in the first photo because it tells such an interesting story. The style of the building is reminiscent of the kinds of institutional buildings I saw in New England in the 1970’s. The road cone on the fire hydrant is hysterical and then there is the idea of a police station serving as a child care facility. Great post, Joanne. Thank you 🙂 So often I wish I was a storyteller. I see things like this building and I just know there’s a good story there but I have no idea what it is. You were literally up close and personal with such a significant piece of American history – a very dark piece and one that still reverberates today. I have very mixed feelings about what they eventually did with the ruins. As a child I didn’t understand the shackles and cells. It was a very dark place. Great shots, Joanne – I’m glad that you pulled them out and shared them with us. Very sad about the Golf Dome! Thanks Donna. I was starting to get a bit of cabin fever after being stuck indoors with a bad cold. Getting out to stomp through knee-high snow to get those photos of the dome was exactly what I needed. Yikes. That’s scary about the gold building. Applesauce — that’s way too much snow, Joanne! I do love that old police building though. Castle wannabe was my first thought. Stay warm. Hugs on the wing! There was definitely too much snow – and it was very heavy snow – and then it got windy. I’m surprised any of us have a roof left! The old police station is a beauty. There has to be some information about it somewhere! Why the turrets? And I agree that the door does not suit the building, but I am still intrigued to know what it looks like inside. I too have folders of photos of places I haven’t yet written about. Maybe this is the year!! Have you tried searching on the address of the building? Sometimes that brings up the history. 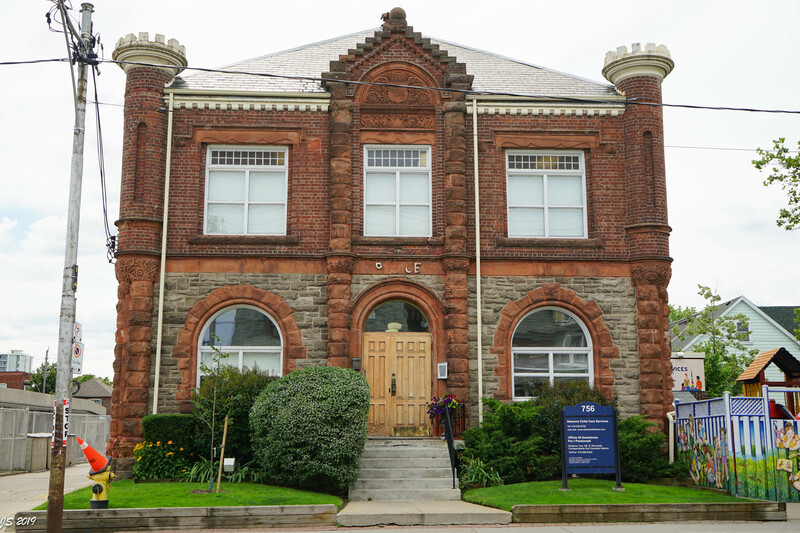 Strange that it didn’t come up in the heritage search, something like this has to have a history – possibly even before it was a police station. The letter box outside the former police station is gorgeous. I think I saw something similar in the lobby of the Chateau Laurier – probably the same vintage. I’ve seen a couple of them around over the past couple of years. I suspect they are quite old. I love that old Police Station. The carving at the top looks very detailed. That sign WOULD have been hilarious on a maternity ward. That’s crazy about the golf dome! I hope they’re able to get it fixed. Earlier this week the dome was still on the ground. I expect it will take a long while to get the insurance settled and a plan to rebuild. I really like the photo of the old police station doors. That golf dome incident sounds harrowing! I hope no one was inside when it came down. I don’t think anyone was inside the dome when it collapsed – but can you imagine?!! Nightmares for a VERY long time! Joanne, I love the architecture of that old building. The red bricks and the ‘castle” style detailing on both signs. The sign is great. I do agree that the door is perhaps out of place and needs a dark stain to fit in with the rest. What a beautiful old building! Similarly to the previous commenter, the door doesn’t look quite right to me. It looks much newer than the rest of the building. It’s so funny that now it’s pointed out, it looks so obviously wrong to me. Wow, I sure hope no one was inside the dome when it came crashing down! I didn’t hear any news to suggest that anyone was inside or hurt when it collapsed. Could you just imagine how terrifying that would have been?! We had a walkway collapse at a school here in SA a week ago. 4 teenagers lost their lives and 20+ others seriously injured. It was horrendous news. That is horrible! I can’t imagine! I like your sense of humor! Too bad what happened to the golf bubble! Yes, sometimes we make the right decisions without ever meaning too. Thanks 🙂 This post really took on its own personality without pre-thought on my part! It pays off and you’ve got the proof! Now let’s institutionalise it! When the news of the fire first broke out, I was obsessed with the fate of the swimmers. I just can’t imagine being evacuated out of a burning building at those temperatures – let alone in a wet swim suit!! Absolutely; beyond uncomfortable. A hotel I was staying in once had a fire in the kitchen and we were all evacuated. It was early on a winter’s morning, and luckily I was already up and dressed. Most weren’t so lucky and I have to say hotel staff weren’t particularly on to it in terms of providing blankets or anything. They seemed bewildered, and some saw it as a chance for a smoke!!! I ended up giving my coat to a woman with a baby — both were in night clothes and not much else. We weren’t outside for all that long, but it seems longer when you have no idea what is actually going on and no-one comes to help. Thankfully I’ve never been involved in a building evacuation for any reason and I hope I never am! It sounds frightening, especially when it occurs in a strange place! It made me realise how quickly the world can change; and how unprepared we normally are for emergencies. If I hadn’t been going to an early meeting, I would have been going down 14 flights of dark concrete stairs in my nightie — or straight from the shower. But at least we could get out, and although the fire was real it was contained. Since then I am more careful to keep my clothes and essentials handy (and organised) when I stay in hotels. A while back I read a blog post about a traveller who was in Mexico City during one of their terrible earthquakes. He talked about that feeling of vulnerability on the street in the middle of this chaos in a foreign country without wallets or passports – not knowing whether their hotel would be safe to eventually re-enter. I made a mental note that in the future, both would be within quick reach in the case of emergency! I remember something similar during the Christchurch quakes, when several hotels were evacuated and a couple I think were not re-entered until demolition. We do the same with our passports. I think a Glaswegian has visited. They like to put traffic cones on things. Usually statues, but a fire hydrant would do. I can’t say I’ve ever noticed this done before. Thanks for the laugh. I loved it until I got to the part about “acts of cultural destruction carried out by so-called Islamic State.” Good God in heaven! Some people need to get a life! They are clearly new windows, but I think the real problem are the white blinds, That’s what makes the windows look rather jarring compared to the rest of the building. I guess when they have a utilitarian space, they don’t give much thought to the aesthetics from the outside. They probably didn’t have an interior designer, lol! “You’re in the right place” ~> YAY! Sorry – this was not taken at the day care centre, but at a community centre. The funny part is that this sign isn’t facing the front entrance. I hadn’t heard about any injuries so I can only assume that the building was empty when it collapsed. On a side note, about a week later, a community centre nearby caught on fire. This cc has a very popular swimming pool and the swimmers were quickly evacuated – in their wet swimsuits – outdoors into -30C temperatures! All I know is that they were immediately moved into warm facilities but I don’t know what exactly that meant. It was a very bad fire and it took 36 hours to fully put it out. Can you imagine?!! … clothes, purses, wallets, phones, car keys … and all you have is a wet swimsuit?!!! I thought of my husband. If he had been in the pool, he wouldn’t be able to call me because he doesn’t know my number. Like so many people, he relies entirely on autodial! That’s frightening. The fire must have been huge. But all the inconvenience is worth it if no one is hurt. 🙂 And I don’t know any phone numbers either! Ha ha. Amazingly, no one was hurt! … but it does make you ponder our tendency to rely on autodial. Love your sense of humour that came shining through in these photos! Keep smiling Joanne – we’re already into February which means March is next! Spring (please be an early one) is on the horizon. Hahahahaha, love the Push, Push Hard sign! So funny! Push, push hard …OMG that is sooo funny…except if you are in labor! I’m glad others have found it as funny as I did. It was the first thing that came to mind when I saw it. The two funny ones being in the right place and push push … yikes about the roof. Interesting to turn the police station turned jailhouse for the wee ones. I love to see old buildings repurposed. It’s always interesting to see how they end up. Now that I think of it, I wonder if the “Police” above the door has partially fallen off over the years, or if they’ve tried and failed to remove it. Somehow that building reminds me of my old elementary school building. Cold and uninviting. oh – isn’t that interesting! I thought it looked like a chess piece. There was nothing like this where I used to live. Someone placed some very pretty flowers at the police station. Push, push hard—you are funny! Great photos and wonderful captions. I’m guessing the door at the police station/day care/should be maternity ward isn’t the original, but it’s a good photo. I was horrified when I heard about the collapse of the dome. It was shocking to see the massive structure crumbled on the ground. I’m sure it’s devastating for the owner since this is their busiest time of year. On a positive note, I don’t think anyone was injured. We had a tennis dome collapse a few years ago. Fortunately that was overnight and no injures either. I still a bit obsessed with the thought of people inside and the terror when that bubble collapses! I hope I never find out! In my opinion the light wood paneled door on the dark brick maybe Police station doesn’t look good. That door needs to be a darker color. Who put that door there? Your photo of it, however, is lovely– and that is the point of this post, so *yay*! I’ve been sitting on these photos for a long time with a sense that something wasn’t quite right. Now that you’ve mentioned the colour of the door, it is SO obvious. It just doesn’t match the colour of the stone! Good eye, Ally!